The Kia Niro features seating for five in a spacious cabin and comes powered by a frugal hybrid powertrain comprising a 1.6L inline-4 and a 6-speed DCT. A plug-in version is available. For 2018, the Kia Niro lineup is joined by a plug-in version. A limited-production Graphite Edition includes Platinum Graphite exterior color, a Harman Kardon premium audio with subwoofer, 8-inch touchscreen navigation, a 10-way power driver's seat, and unique 18-inch gloss black wheels. HID headlights, a wireless phone charger, and a suite of advanced driver assistance features are now standard on Touring models. 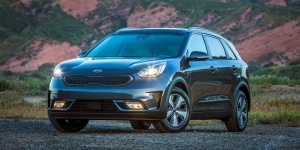 Get the best price for the Kia Niro of your choice from a dealer in your area. Request a price quote now.